Alhamdulillah is a phrase Muslims use to show gratitude towards their Creator. Creator of everything and everyone. The main purpose behind #AlhamdulillahForSeries is to instill the attitude of gratitude and promote joy in general. Happiness is contagious so spread it far with your ideas because we are holding a FREE to enter Gratitude Caption and/or art Contest (in partnership with 11 Collaborators alhamdulillah) to mark the official launch of #AlhamdulillahForSeries book – A Muslim’s mini Gratitude Journal (for Ramadhan and beyond inshaaAllah). (InshaaAllah the books will be shipped to you maximum by Eid). 2) 8″x8″ hardcover book (with FREE international shipping). The books are available to buy through different stockists around the world as well. This contest is an extension of our Instagram exclusive ‘#AlhamdulillahForSeries‘ and our previous Gratitude Art Contest. But this time, we will have 12 winners in total with 12 prize bundles. (11 from other amazing collaborators and 1 from us). 1: Define what is GRATITUDE for you – what are you grateful for? Highlight a unique side of gratitude. Something that few people think of when they talk about being thankful. Or something that few people associate with Allah (thanking Him) when they are happy or feel blessed. 2: Send us your caption and/or art entry (through Email, Facebook, Twitter, Pinterest, Instagram etc. )* or simply comment below. Like/follow/subscribe to Ayeina and all other 11 collaborators to stay updated with the contest and prize shipping etc. (optional – this won’t affect your chances of winning). Preferably a scanned version of your illustration if you are working on pages (hint: watercolor illustrations get an extra point since we’d be using them in #AlhamdulillahForSeries most probably). We will put all the entries on our Facebook page. So like our page to see all the submissions. You can also send in your entries via Facebook message or commenting below the Contest (pinned) post. If you are entering the contest through Instagram/Twitter, then either DM(Direct Message) us on IG or simply tag @ayeina_official. 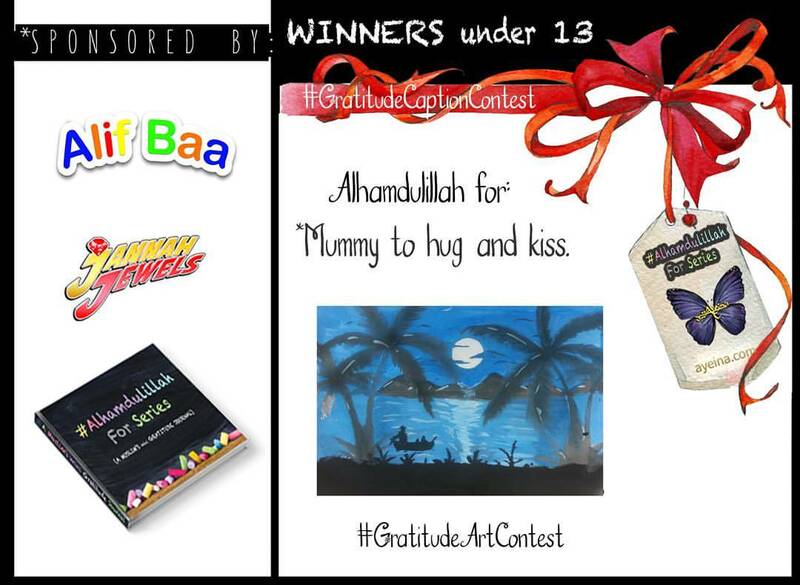 Hashtag your entry with #gratitudeartcontest (if submitting art) , #gratitudecaptioncontest (if submitting caption) & #AlhamdulillahForSeries (for both) – so everyone can browse through the entries submitted. Please make sure to use both hashtags otherwise your entry may not be received. 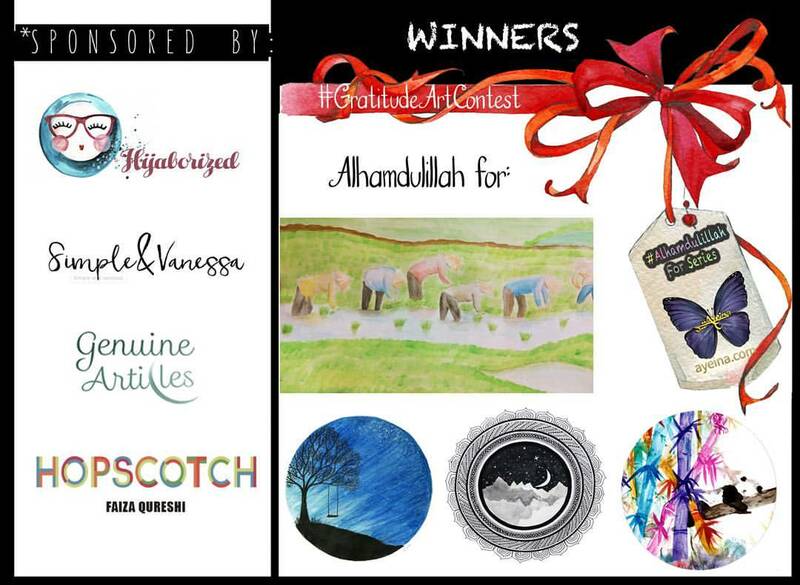 1) #AlhamdulillahForSeries booklets (A Muslim’s mini Gratitude Journal) for the winners. A month of helping you and your kids develop an attitude of gratitude in shaa Allah. 2) *Islamic moments* with its drool-worthy designs – Who’ll be giving away their famous BISMILLAH notebook and a set of 6 gorgeous EID cards. 3) *Hijaborized* will be giving away a 20€ gift voucher (aka eidi :D) and you can choose anything from their beautiful products in the shop. Go visit their site: https://hijaborized.com/ and reserve the best ones for yourself. 4) *Noor Box* will be giving away one of their awesome Map Boxes to the winner. The Islamic subscription box will include learning and fun combined to help your child navigate his/her way around the world with you, while learning the different parts of a map, and the many Muslim firsts in geography. Between crafting a compass, going on a pirate treasure hunt, and playing with their very own globe, your little one is sure to love this box! The virtue is discipline—how we must be disciplined in our faith, and the importance of discipline in our lives at home and at school. 5) *Almaurid Books*, giving away the cutest story “Aisha Learns to Bake” by Latifah Peerbux. Aishah helps her mum to bake a cake and finds out that so many ingredients that are needed for the cake, make funny sounds! while discovering how Allah (SWT)’s wonderful creation and blessings are helping us every day. This will surely bring a smile on your face. Not to mention the simple recipe in the end for your little chef who will inshaaAllah be helping you out in the kitchen this Ramadhan. “Bismillah Soup” and “Yasmin’s BellyButton”, written by the very talented Asmaa Hussein. Technically these are children’s books but they can belong to your bookshelf as well. Never thought a children’s book could bring a tear to an adult’s eye. A) Bismillah Soup – About Tawakkal Allah and the importance of a community. B) Yasmin’s Belly Button – About the connection of a mother with the child. 7) *Jannah Jewels* will be shipping you 1 set of Jannah Jewels Books (1 – 4) – representing Muslim literature in an informative and exciting way. The books are written to draw attention to centuries of cultural, scientific and ground-breaking achievements from the Islamic heritage. The author (Umm Noura) hopes the books will create awareness of how these invaluable contributions played a crucial role in shaping our world today. 8) * Islamopedia Books * will be giving an amazing book “Young explorer’s adventures in Makkah”. We designed a few illustrations for this book (as seen in the picture). Zaynah, Maryam and Ali are the three young explorers who explore Makkah, Islam’s holiest city, with their guide, uncle Hamza. An exciting journey of revealing lands and places that were an essential part of the development and history of Islam. This book is intended to serve as a guide for when you and your young ones when performing Hajj or Umrah and to introduce you to aspects of Makkah and Madinah beyond the Masjid Al Haram and the Masjid Al Nabawi. 9) *Simple and Vanessa*will be offering a bundle of four courses to help you build your own brand, business or a website. Her Brand Discovery Courses will not only help you launch your own business but also help you save a ton of cost while doing so inshaaAllah. If you are in the planning stages of starting a blog or a business and need a bit of clarity on your brand’s overall feel, she’s your go-to person for sure. 10) *Burooj Angels* will be offering an amazing one-on-one interactive Audio-Visual session on role of leadership among women SHAJARAH (tree). Perfect to boost your eemaan in the last days of Ramadan. Fundamentals of Islam and Articles of eemaan (faith). 11) *Halal Goodies*will be sending a luxurious box to one of our contest’s winner. (Note that this option is only available to UK winners (if any)). 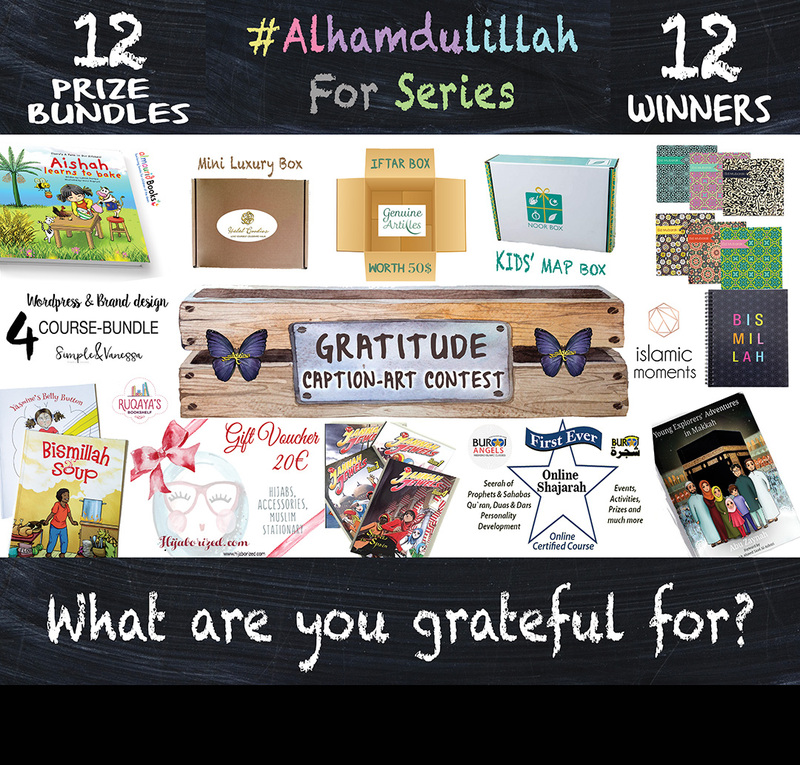 12) *Genuine Articles* (an Islamic seasonal subscription box) will send the US winner (if there is any) one Summer Iftar Box. We have also designed Recipe cards for them so you could have your favorite recipe at hand. The prizes will be divided into two categories – 6 art winners will get to choose the prize from 12 prize bundles in a descending order and 6 caption winners will get to choose the prize from 6 prize bundles in a descending order. Prize shipping will be free of cost. No cash or other prize substitution shall be given in replacement. Best 15 entries will also receive a certificate of excellence/ appreciation. Please do not submit obscene or offensive (racially, religiously or sexually) art/captions or images with faces of animate beings (that’s how we roll). If you draw people, omit the faces. You can check our Instagram/Facebook page to get a better idea of how we design. Entries that are incomplete or do not adhere to the rules or specifications will be disqualified. You may enter as many submissions as you wish. Though, one person cannot win more than one prize bundle. Entries will be accepted online starting from 20th May 2016 to 7th June 2016. Official announcements of winners will be made on 10th June 2016 in shaa Allah. All online entries (captions/illustrations) must be received within this time period. Note that Halal Goodies (mini subscription box) can only be shipped to UK while Genuine Articles (subscription box) can only be shipped to US. All other prizes are eligible for international shipping. These entries may be used in Ayeina’s #AlhamdulillahForSeries’ Instagram page with full credit given to the original artist/caption-ist. They might also be used in #AlhamdulillahForSeries future books where mentioning each and every artist would be difficult but they’ll be given a shout out on social media accounts and our website inshaaAllah. Almost all entries will be posted on Ayeina’s Facebook Page to collect user votes (likes). Winner will be selected on the basis of number of likes (30%) and 70% judgement will be based on creativity, idea and presentation (in the case of art submission). Winners will be notified by email and announced on Facebook, Twitter and Instagram for others to know as well. Ayeina or any of the collaborators shall have no liability for Winner’s failure to receive notices due to spam, junk e-mail or other security settings or for Winner’s provision of incorrect or otherwise non-functioning contact information. If Winner cannot be contacted, is ineligible, fails to claim the prize within 2-3 days from the time notification was sent, the prize may be forfeited and an alternate Winner would be selected. Any and all prize related expenses (except for shipping), including without limitation any and all federal, state, and/or local taxes, shall be the sole responsibility of Winner. BEST OF LUCK EVERYONE! We look forward to receive your entries. There have been 15 chosen winners instead of 12 (the figure we initially agreed upon). Zoha Siddiquii – Alhamdulillah for people who work for us day and night. Firdaus Akrami – Alhamdulillah for calm after the storm. Aysha Khateeb- Alhamdulillah for night-time to rest and unwind. Ismat Sami – Alhamdulillah for furry animals. 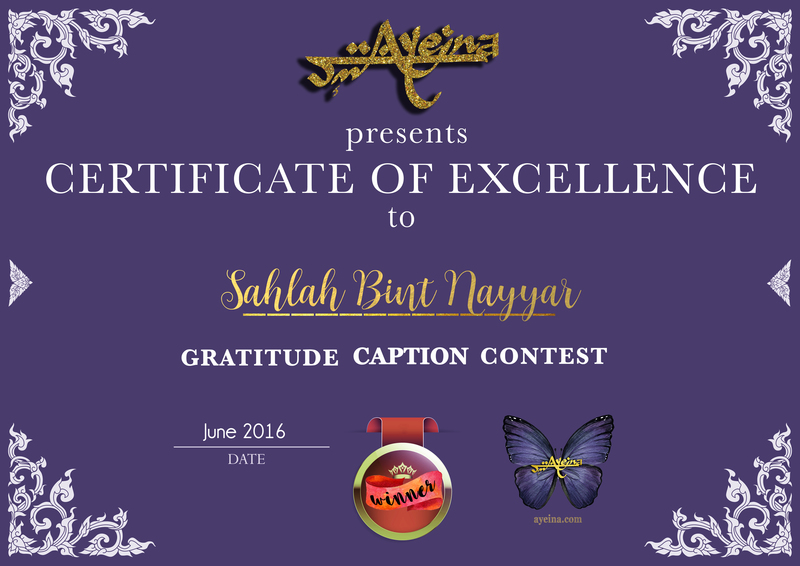 Masha Allah… jazaakumAllah khayr for promoting gratitude and joy through your journal and contest. I always find myself writing Alhamdulilah for… in my diary these days. It is a powerful habit to cultivate and live by. 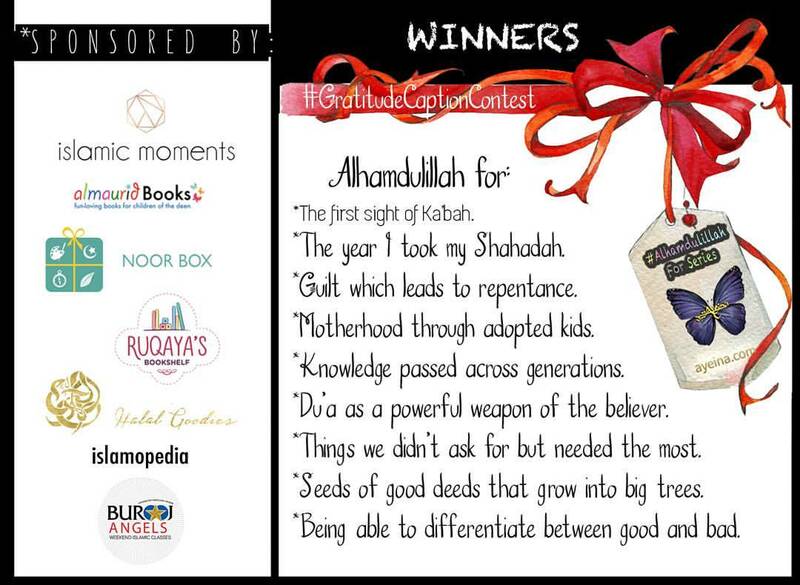 Will be sending my entries soon insha Allah… And looking forward to reading all the other entries. Waiyyaki amina. That indeed is a beautiful habit. Helps you with staying on the right track. Will look forward to your entries. And ya… you can visit our facebook and instagram account to stay updated. Have already entered over on Facebook! A good list of prizes…I wish best of luck to all..
Best of luck to you too, lady!